One smartphone asked another smartphone why he broke up with his girlfriend. He lamented, “She became disconnected and had too many hang ups.” Forgive the phone humor, we will get Siri-ous. It is not a joke that mobile has become the main way customers are consuming digital media. According to a recent report, “mobile now accounts for 69 percent of digital media time spent”, with a large and still growing segment of people relying solely on their mobile devices for their internet usage, never using a laptop or desktop. Admittedly not every serious shopper for costly goods or services searches on a mobile device, but the trends and trajectory are clear. If you haven’t thought about your digital presence on a 6-inch screen, your lunch is probably getting eaten by your competitors. Like many, you probably create email blasts or update your website on your desktop browser, but have you also checked to see what they look like on your mobile device? 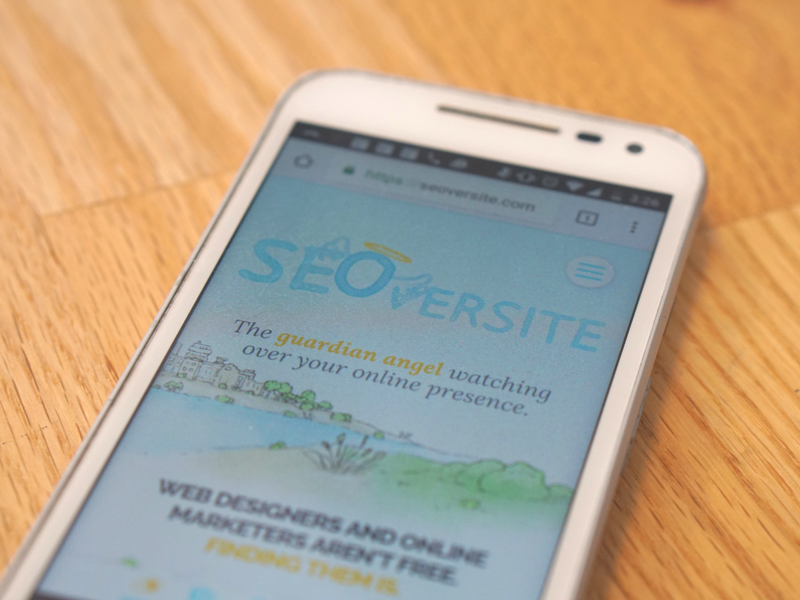 In Issue #3 of the SEOversite Newsletter, “Mobile Friendly Design Tips” we discussed the pending impact of Google’s “Mobilegeddon” and the basics of improving your mobile web design. If you haven’t done so, use this link to see if your website is considered mobile friendly. If it isn’t, call us immediately because you need a new site pronto. With the increased consumption of, and the increased weight Google assigns to, mobile content, businesses must place an amplified focus on providing a positive user experience to make both consumers and Google happy. In November 2016, Google launched its mobile-first index experiment, and once the kinks are worked out, will likely be using mobile versions as the primary search engine index. Don’t panic – Google has said that the change won’t drastically affect rankings, unless a business’s mobile and desktop sites differ dramatically. Separate mobile and desktop versions are outdated. All sites should now utilize responsive design – a site that automatically changes its image size, script ability, and resolution while maintaining the same content no matter the size of the screen on which the content is viewed. Content is not king, but you can’t be king without content. While the separate, mobile sites of the past limited content due to the smaller size of the page (compared to desktop), a responsive site will maintain the same robust content across platforms, helping you keep, and improve, your Google rankings. Check page load speed on mobile as well as desktop. Computers running on an internet connection or Wi-Fi are going to run faster than a smartphone running on a 3G network. Google claims the average retail website takes 6.9 seconds to load on a mobile device, longer than the average consumer will stay on a page that has not loaded (3 seconds). Your web team should be aware of ways to speed up the load time on the mobile version (and if they aren’t, contact us at guardian@seoversite.com). As mobile continues to evolve, consider eventually creating an Accelerated Mobile Page built specifically to improve speed and utilize some of Google’s mobile-exclusive functionality. The differences are technical, but essentially this is Google’s way of creating an easier process for the script of a website to be communicated and loaded specific to mobile in their attempt to improve the mobile user experience. Design emails and images specifically for mobile — Considering two out of three emails are read on smartphones or tablets, don’t forget to review a version of your next e-blast or social media post on your phone as well as your desktop. Make sure the dimensions of your image are optimized for the appropriate feed (which you can change in the settings of many editing programs). If it doesn’t look good on mobile, you’ll lose most of the visitors you’re hoping to convert. As people increasingly rely on their mobile devices for their digital media consumption, the trends and best practices will continue to evolve. To ensure you are on the forefront of mobile marketing, give us a call at (305) 455-0720 or email us at guardian@seoversite.com.